Is this how farms will look in the future? Downtown Manhattan is hardly a place you would associate with agriculture. Rather, with its countless restaurants, cafes, shops and supermarkets this is a place of consumption. And so every morsel, every bite of food New Yorkers munch through every day must be trucked, shipped or flown in, from across the country, and across the world. Now though, scientists at Columbia University are proposing an alternative. Their vision of the future is one in which the skyline of New York and other cities include a new kind of skyscaper: the “vertical farm”. The idea is simple enough. Imagine a 30-storey building with glass walls, topped off with a huge solar panel. On each floor there would be giant planting beds, indoor fields in effect. There would be a sophisticated irrigation system. And so crops of all kinds and small livestock could all be grown in a controlled environment in the most urban of settings. That means there would be no shipping costs, and no pollution caused by moving produce around the country. It’s all the brainchild of Columbia University Professor Dickson Despommier. And, says the professor, vertical farming would allow some existing traditional farms to be returned to natural forests. Good news in a time of global warming. “Even if it’s not quite natural…. a little bit factory-like in terms of its production, here’s what you’re going to get back: you’re going to get back the rest of the earth. And I’ll take that any time.” The plan is to make the whole complex sustainable. Energy would come from a giant solar panel but there would also be incinerators which use the farm’s waste products for fuel. All of the water in the entire complex would be recycled. Several hours drive north of the city in upstate New York, Ed Miller’s 18,000 apple trees are in full bloom. Like farmers across the world he has lived through decades of constant change and innovation. But he remains, at heart, a man of the soil. So what does he think of the virtual farm concept? He is, perhaps, surprisingly positive: ”It looks like a fancy greenhouse,” he says. “It’s fabulous, it will be very interesting. It will be phenomenal.” For now, vertical farms are a virtual concept. But the scientists insist that the theory is sound. All they need now, they say, is the money to make this a reality. 1. The urban hydroponics model of Vertical Farming is both presently realizable and profitable. The investment return is comparable to stock market averages. 2. Properly implemented renewable energy sources can significantly reduce utilities expenditures, justifying their initial capital cost. 3. Corporate and institutional investors are willing to finance Vertical Farming as a result of the operations significant secondary benefits. 4. Vertical Farming presents a unique investment opportunity as it aims to revolutionize our understanding of food production and urban development. The Vertical Farm project was conceived as a response to increasing pressures to reliably produce food at reasonable financial and environmental costs. Traditional agriculture relies too heavily on chemical control and is too vulnerable to natural conditions in order to sustainably fulfill global food demand for a conservatively-estimated world population of 9-10 billion in 2050. Further, the environmental damage resulting from broad-scale agriculture has negatively impacted population health on a vast scale in many developing nations. Vertical Farming is envisioned as a solution to the untenable proposition of a permanent global agricultural status quo.. As such, Vertical Farms stand to revolutionize the concept of food production and aims, ultimately, to improve human life on a global scale. Yet, brashly forging ahead towards such goals is not the theater of the Vertical Farm project. Educating the world on the future of food production and eliciting support for a solution are important first steps that are well under way. For Vertical Farming to one day have its intended impact investors, corporations and other financially endowed visionaries must be convinced about Vertical Farming’s financial practicality today. The Vertical Farm project group realizes that the development, adoption and proliferation of Vertical Farms will begin slowly with many risks involved. The history of almost every paradigm-shifting technological advance includes a period of disbelief and public rejection. In time, however, the great momentum generated by staunch supporters leads to the day when such technologies are so broadly incorporated into society as to be taken for granted. The building parameters were established to keep the capital outlay under $100 million while taking advantage of some economies of scale. The focus of the building is function only. Traditional greenhouse operations are similarly initiated with an emphasis on minimizing startup costs. Calculating the cost of the building structure present a challenge given the fact that no building of this kind exists today. While the most advanced concept of a Vertical Farm could potentially cost hundreds of millions of dollars to construct, this model is based solely on existing technologies and construction possibilities. The Vertical Farm will be much like a commercial office building sans a finished interior, and will house a completely unified utilities management system. Each line item in the building construction cost estimate is calculated based upon comparable unit cost measurements from completed projects in the United States. Unit costs, while not as accurate as project based estimates, were more easily estimated and allowed for some amount of scalability to the project costs. Prices were standardized to 2005 purchasing power and cost estimates taken from projects in different regions of the U.S. were adjusted to New York City prices using the mean hourly wage. The costs and associated benefits of the renewable energy systems are discussed in further detail later in this report. The profitability of the Vertical Farm is highly dependent on generating immediate revenues from a reliable product. The high cost and variable quality of New York City produce is a norm that no one has sought to question. By virtue of efficiency, the Vertical Farm must be a monoculture. A single twenty story production facility cannot offset the cost of maintaining variable environment conditions for different plants. 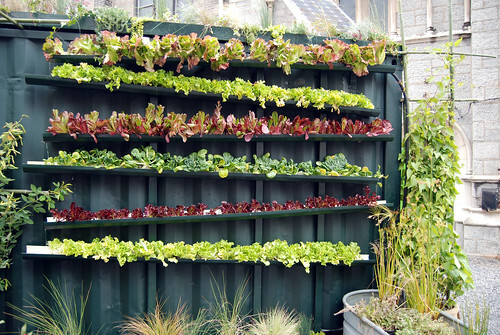 Thus, the production model of the Vertical Farm is based solely on gourmet lettuces. The production of lettuces, in fact, includes a wide variety of easy-to-grow greens that make up the massive amounts of salad that are consumed in New York City every day. In 2004, total lettuces consumption reached a record 34.5 pounds per capita, with more than 8 pounds of consumption moving towards special and leaf varieties. Consider the following rough calculation: 8 million people in the five boroughs of New York City times 8.1 pounds of leaf lettuce consumed per person times $1.69 per pound wholesale equals a $108 million dollar industry pre-retail. The market for premium produce in New York is clearly viable. However, as the market is no doubt saturated the operation must focus on combining maximum perceived quality of product with competitive pricing. Thus, we have identified premium prices for gourmet and leaf lettuces at upscale New York City retail outlets such as Whole Foods Market, Zabar’s and Gourmet Garage in order to design a competitive model. The urban hydroponics economic model is based on a direct-to-consumer sales strategy which may be ultimately inefficient, but provides the necessary income generating potential to run the operation. The most successful high-yield, hydroponic lettuce operation in the U.S. is managed by Cornell University in upstate New York. The Controlled Environment Agriculture (CEA) Commercial-Scale Lettuce Production Prototype is a highly autonomous hydroponic system that implements a unique solar lighting algorithm patented by Cornell University. Combined with supplemental lighting from water-cooled bulbs that can be placed very close to the plants without heat damage, the operation has achieved yields equal to 470 tons per acre. Maximum production in California using traditional agriculture is currently 20 tons per acre. At the same time, the CEA facility uses only 2.1 gallons of water for every pound of lettuce produced. Traditional agriculture requires an astounding 71 gallons of water per pound of lettuce. Additionally, the CEA system is zero waste, meaning that all water is filtered and recycled back into the facility. Hydroponic technology has increased yield potential by more than 23 times while decreasing water usage by well over 30 times. These gains are critical to the viability of the urban production model due to its high capital cost. In basing the Vertical Farm hydroponic model on the Cornell CEA facility, the major obstacle was dealing with the shift from a combined sunlight and supplemental light system to a 100% artificial lighting system. However, given the greater controllability of a completely artificial system, it can be expected that the CEA algorithm can be mimicked in the Vertical Farm. The price per head of lettuce was set just above April 2006 prices at Upper West side markets such as Zabar’s and Gourmet Garage. The reality of price fluctuations will have an impact on the ability to consistently price Vertical Farm lettuce in a maximally profitable manner, but the consistency of the operation could offset the seasonal highs and lows to achieve an optimal annual price average. Labor costs were calculated in two parts: management/skilled staff and wage labor. The chart below shows a breakdown of the labor costs. The urban hydroponics model takes into account the labor required to currently operate the Cornell CEA facility and the guidelines of a published hydroponic lettuce expert Lynette Morgan, Ph.D. from New Zealand. in order to estimate total human resources expense. Salaries include benefits and insurance, and wages were set at 60% above the current New York City minimum wage in order to strongly attract workers. The seeding, spacing, harvesting and packing operations must take place 365 days per year. The daily workload can be reasonable managed in 8 hours with 50 wage workers. Some emergency electrical energy usage was considered a certainty given the potential downtime for the biogas cogeneration system and the likelihood of extreme heat requiring additional cooling. Traditional electricity expense for the methane digestion cogenerator was calculated assuming a 5% downtime target and 2006 rates for electricity of $0.164 per KWh. Electricity needs for additional cooling capacity beyond geothermal in the highest heat summer months from June to August were estimated using the following parameters: 6 hours of medium intensity cooling per day over 92 days, integrated part load value for chiller efficiency of 0.47 kW/ton of capacity and total system energy usage 50% greater than chiller demand. Production supply costs were estimated using the a hydroponic lettuce consumables profile developed by Ohio State University and an independent investment analysis of the Cornell CEA system17. Operational costs of the engineering facilities were estimated at 10% of the capital cost annually. Office expenses were set at $200,000 as a ballpark estimate for a limited staff w/ student intern support, equipment leasing, supplies and postage, payroll outsourcing, banking, phone and Internet. Legal services are expected pro bono. With net profits of roughly $12 million annually, the urban hydroponics model of the Vertical Farm expects to return its initial investment of $84 million in 7 years. After the payoff, investors will be earning large annual dividends from the operating profits: $12 million per year through the 10th year of the facility’s operation and $14 million per year thereafter (Appendix A). By these estimates, the principal investment of $84 million can be effectively doubled in less than fifteen years. The following table compares the Vertical Farm to the two common market investment yield indicators: stock and bonds. The present analysis does not weigh the respective benefits of debt and equity financing for the venture. The payout from the Vertical Farm is the following table is being considered as a dividend from private stock ownership. The time to double principal neatly shows the Vertical Farm venture as somewhat less lucrative than common stocks. However, the perceived risk of any venture is understandably high, and seeking investors for a project with a low effective interest rate will require strong emphasis on the project’s implications. While a variety of potential sources for renewable energy exist or are being currently researched, the urban hydroponics model utilizes only those methods which are proven and for which cost estimation is possible. The three renewable energy technologies incorporated into the urban hydroponics model are methane digestion (biogas) cogeneration, photovoltaic (PV) solar capture, and heat transfer geothermal. The urban hydroponics model also relies entirely on “second-hand” water sources by purifying urban grey water. No water is ever outputted as waste. Because general information on the mechanisms of renewable energy systems is widely available, this section focuses only on the aspects of the technologies which are directly pertinent to the economic profile of the model. The results of the following discussion clearly indicate that the significantly higher front-end cost of implementing renewable energy systems is rapidly recovered by a very large savings in annual energy expenses. The waste-to-energy concept is being implemented more and more in agricultural settings, livestock farming, and in municipal water treatment. Anaerobic digestion is a fundamental ecological process that can be stably controlled by human intervention to produce large amounts of flammable methane gas. Waste-to-energy was deemed viable within New York City due to the significant total amount of organic waste generated by households and businesses. In addition, dog feces, produced in copious amounts within New York City every day, has already been identified as a source for methane digestion in San Francisco. The Vertical Farm’s biogas facility will be almost entirely dependent on the waste generation of the City. Given a 95% packout rate for the lettuce generated in the Vertical Farm plus a small amount of unharvested root material, the farming operation produces only 0.2% of the 320,000 kgs of organic material needed to maintain maximum output. This “feeding rate” was calculated based on today’s most efficient digestion methods incorporating thermal wet oxidation. Under these conditions, each 1kg of biomass added to the digester produces 32 ft3 of gas with an 84% methane content. The methane is converted to electricity by a fuel cell at 40% efficiency. The remaining energy is recaptured as heat, resulting in 90% efficiency overall. The heat can be used to dry the digested humus into a saleable garden product, operate a gas absorption refrigeration system for lettuce storage, or provide supplemental heat to the building environment during the winter. In sum, the biogas facility generates 8 kWh of electricity for each kg of biomass added. The Vertical Farm’s major energy demand comes from the 4500 kW water-cooled metal halide lighting system that uses 81,000 kWh per day or 2.4-2.5 million kWh per month. The annual electricity cost of the Vertical Farm lighting system using Con Edison generated power would be $4.85 million28. This cost is all but eliminated by generating energy from residential and public wastes that have no market value. Annual maintenance costs for the biogas facility was estimated at 3.2% per year for the $8 million fuel cell and 5% per year for the digester system. Estimating the heating, ventilation and air cooling (HVAC) requirements for any building is a difficult and often imprecise process. The tremendous cost benefits of geothermal climate control demand that the technology be considered with as much economic detail as possible. With capital payback possible in as little as 2 to 6 years, low maintenance costs and zero environmental impact, the financial benefits of geothermal have been proven in many setting across the country and around the world. Because the Vertical Farm Entrepreneurship group does not have HVAC engineering expertise, the heating and cooling load for the urban hydroponics model was based on tonnage of capacity per square foot installed in existing buildings. The main considerations for adjusting this estimate were based on perceived heating load and insulating capacity. While the 4500kW lighting system could potentially generate an immense amount of heat, because the system is water-cooled, the heating load from this source is significantly reduced. During the winter, the heated water from the lighting system can be combined with the geothermal piping to provide additional heating capacity with minimal additional infrastructure. 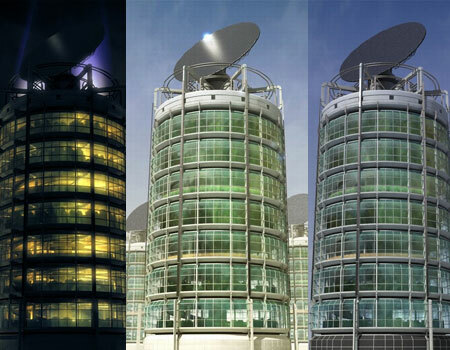 Solar heat within building is controlled by the electrochromic (EC) glass shell. EC windows can be darkened using low voltage electrical currents, and the reduction of solar energy pass-through can reduce cooling energy requirements by up to 49% according to computer simulations. Increasing solar transmittance provides heating in the winter. Because the Vertical Farm is designed with complete coverage fenestration, the building is not expected to be highly insulated. Given all of these considerations and a desire to over- rather than underestimate, the urban hydroponics model includes a 1000 ton geothermal system, over 60% more tonnage per square foot than one of the highest capacity systems in operation in the United States today8. At a full system cost of $2500 dollars per ton of capacity, the geothermal construction total comes to $2.5 million. Solar capture via PV cells is among the lowest cost energy resources available. Beyond the initial capital cost, solar energy is truly free and consistently available without price fluctuations. The Northeast U.S. is often mistakenly pegged as a region without significant solar potential. In fact, the annual solar energy total reaching ground level in the New York area is only 35% less than that in the Southeast. The 10,000 ft2 of rooftop area provides an opportunity to generate 800 kWh of electricity each day, on average, based upon a solar constant providing 160 kWh50 of electricity per year at 19% PV cell efficiency. The cost of the array was calculated based upon per kW PV array prices noted by the Department of Energy15 and adjusted upwards to account for the higher efficiency and sun-tracking motors. In order for the electricity to be directly available for the facility, flywheel energy storage units have been budgeted into the energy management system to provide solar electricity at a constant rate to the office, lab and retail facilities. The 304,000 kWh of electricity generated annually provides a costs savings of only $50,000, but this amount is significant in comparison with the overall office expense budget of $200,000. The average single family household in New York City uses approximately 100,000 gallons of water each year at a cost of $1.60 per 100 cubic feet of water or approximately $214 each year. The highly efficient float-system of hydroponic lettuce production as achieved by Cornell’s CEA facility allows the Vertical Farm to produce an entire year’s production, nearly 12 million heads of lettuce, with only 1.6 million gallons of water. This translates into the annual water use of only 80 New York City households. The extraordinary efficiency of the production process is bolstered by the zero-waste water cycling capability made possible by a multi-stage organic water filtration system or living machine. Living machines can incorporate a variety of technologies to purify water depending on the characteristics of the input stream. With a daily water requirement of just over 20,000 gallons per day, an appropriate living machine system can be installed for only $500,000 dollars17. The water cycling system is the only renewable technology within the urban hydroponics model that does not provide an economic incentive. In fact, the system will likely cost more in annual maintenance than the direct savings in water use of only $17,000. However, the technology is a centerpiece to the future development of synthesizing vertical farm technologies and must be incorporated. Obtaining sufficient capital to initiate the Vertical Farm venture requires seeking a range of sources within two broad investor categories: corporate and institutional. On the corporate side, food production and processing companies and retail food outlet chains present a potential capital source because the future of Vertical Farming may very well prove to be the future of food production for humankind. As such, licensing Vertical Farm technology in a limited fashion creates an opportunity for forward-thinking corporations to capitalize on a technology that will not become available to the public for some years to come. The two important institutional sources of potential monies are private venture capital firms and philanthropic foundations. In presenting the Vertical Farm Project to these respective groups, different attributes need to be emphasized or deemphasized in order to make the project as attractive as possible and maximize the probability that each group will invest. Food producers and retailers will find vertical farming to be a cost-effective and sustainable method for producing and sourcing fresh produce, as well as an important public image and marketing mechanism for appealing to consumers. Vertical Farming will decrease the need for both packaging and transporting foods. Food production companies could grow raw ingredients “on-site” along with packaging and administration facilities. Companies will save money by reducing fuel costs, a rapidly increasing expense. Money will also be saved by having a secure and consistent source for products that traditionally vary greatly in availability and price. Many food production companies are already interested in developing practices which are more friendly to the environment and more sustainable . For example, in May 2002, three large food production companies (UniLever, Groupe Danone, and Nestle) launched the Sustainable Agriculture Initiative (SAI) Platform. Seventeen other members have since joined the platform, including big names such as Dole, Kraft, CocaCola, and McDonalds. The members are able to share costs of developing sustainable agricultural practices with other members. The SAI supports sustainable agricultural practices which secure adequate food supplies, protect and improve the natural environment and resources, and economically viable and responsible farming systems. These companies also plan to further develop sustainable agricultural practices by testing them through pilot projects . The Vertical Farm venture is an ideal test project for developing a truly self-sustaining food growing process. As the world’s largest producer of fresh fruit and vegetables, Dole is a likely investor in the Vertical Farm venture. Having generated revenues of $5.3 billion in 2004, Dole is financially capable of committing to large capital financing projects . Dole has shown growing interest in sustainable practices, employing over 40 senior scientists to research irrigation, pest control, and organic farming. Plus, they already source products from greenhouses such as the SABA laboratory in Sweden which produces lettuce. Highlighting the competitive benefits of vertical farm technology is a key selling point to corporations. While the Vertical Farm Project aims to make the technology available to all in the future, the Entrepreneurship must capitalize on exclusivity during the startup phase. The potential to profit unchallenged from an expensive, patent-protected process or product is a viable business strategy critical to the pharmaceuticals industry, and readily adaptable to food producers. The food markets can benefit from investing in the Vertical Farm venture by knowing that fresh produce will be available year-round available. A Vertical Farm in New York City will decrease the necessity to transport out-of-season crops by growing them indoors throughout the year. Consumers generally favor paying consistent prices on food items and easier grocery budgeting could lead to healthier eating by decreasing fast food consumption in some populations. Increasing popularity of natural and organic products combined with growing concern for the environment among consumers has moved retailers to stock products that are produced in a manner that is friendly to the environment. Whole Foods Market is the nations leading retailer of natural and organic foods, experiencing sales growth of over 140% from 1999 and 2004. Whole Foods has strong track record of contributing to environmentally sound programs. They currently operate five stores using solar energy for approximately 20% of total energy needs . They are the largest corporate user of wind power in the country, recently making the largest wind energy credit purchase in the history of the U.S. and Canada , and now supplying 100% of their energy via wind. As the #1 Green Power Company in the U.S., Whole Foods Market is a perfect retail partner for making Vertical Farm a household name. Venture capital firms would be a good source of funds because they are extremely interested in being the first to invest in a new exciting technology, wish to support entrepreneurs around the world who have unique, breakthrough ideas , have an extraordinary amount of funds available to invest in ventures predicted to be profitable and transform industries, and their reputations are invaluable and may be willing to take on riskier ventures if positive publicity is at stake. According to BusinessWeek magazine, all venture interests are now opening their ears and vaults to “clean” technologies . Among boutique firms targeting environmentally sound startups is Empire State Venture Group (ESVG) Inc., host of the annual SmartStart Venture Forum in Albany, NY. A company utilizing recirculating aquaculture (Aquafilter technology), Fingerlakes Aquaculture, Inc., recently secured $1 million through this forum. ESVG’s investment history has shown they are willing to invest in green technology-based enterprises like the Vertical Farm. Their mission entails fostering “collaboration among organizations in the private and public sectors to promote the development, success, and expansion of technology entrepreneurship in the Northeast” and one of their goals is to “encourage entrepreneurs in the technology sector to remain in the Northeast as they grow and assist them in gaining access to the services and education they need to continue their growth” – these tenets are conducive to developing the Vertical Farm in New York City. Philanthropy is a good source of funds because many do-gooders share a common philosophy with vertical farming – to enhance the common good and improve human well being – and they comprise an enormous amount readily available funds. As of 2005, the top ten largest U.S. foundations alone have given out almost $4.4 billion in a variety of ways. As a major source of funding for humanitarian causes philanthropic giving receives substantial tax breaks in the United States. Ted Turner would be the ideal philanthropic supporter of the Vertical Farm venture. He is America’s largest private landowner (2 million acres with a higher GDP than Belize), and he also has the largest private Bison herd in the world, using his bison business to highlight the animal’s environmental and health benefits over cattle. He formed the Energy Future Coalition to identify options for the energy needs of the world’s poor and the Turner Foundation in 1991 for maintaining the earth’s natural resources and improving the quality of the natural systems that sustain the human race. The mission of Turner Enterprises is to “manage Turner lands in an economically sustainable and ecologically sensitive manner, while conserving native species.” His creation of the environmental superhero, Captain Planet, and the Turner Tomorrow Fellowship–awarded to works of literature offering positive solutions to global problems–shows he is ideologically aligned with Vertical Farming. The Vertical Farm Entrepreneurship has identified New York City as a target location for developing the project. The city, while certainly upholding its cache is one of the greatest urban centers in the world, has lost some of its cutting-edge image to cities on the West Coast and to other newer cities around the world. The Vertical Farm venture is an opportunity to bring what is viewed as a radical technology into the center of New York City’s plan for the future. In the search to provide direct non-cash capital support for the Vertical Farm project in New York City, two stakeholders were easily identified: the government of the City of New York and Columbia University and other major New York educational institutions. 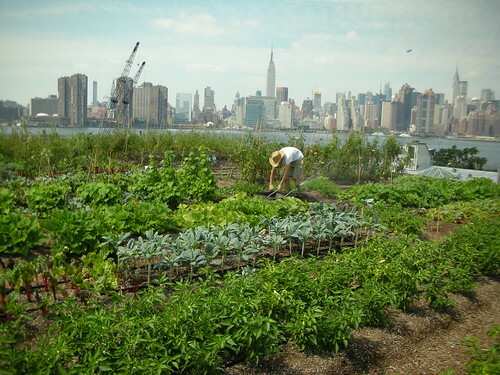 The political will, land control and public policy and relations mechanisms within these institutions are important contributors to a successful planning and developing of the Vertical Farm in New York City. Due to the common interests of these two parties, the same three points may be presented to both in an attempt to convince each to support the Vertical Farm venture: implementation of a vertical farm provides 1) substantial cost reductions due to the facility’s renewable/sustainable resource systems 2) indirect economic benefits from neighborhood revitalization and 3) a decreased burden of public health costs from improved local environmental conditions. Both New York City and Columbia University own undeveloped property in poor neighborhoods, giving them opportunity and means to provide land for the project. Columbia already has a long term plan to develop the land owned by the university in Manhattanville . A Vertical Farm could easily be incorporated into that campus plan, especially since the university claims that “Columbia is committed to the principles of environmental stewardship and is studying possible ways to implement these concepts on its existing campuses as well as any future development.” In conjunction with Columbia’s plan to develop the area of Manhattanville, a Vertical Farm could help improve the neighborhood. A “world’s first” technical facility would generate significant public interest in the neighborhood. Abandoned or undeveloped buildings would be re-occupied, creating a busy, safe commercial area. Concern has been raised that gentrification of the neighborhood would harm the lower-income residents , a common concern to all urban development. Thus, the Vertical Farm venture must emphasize its commitment to community by employing local residents and providing them with the income and job security to prevent their displacement. Northern Manhattan is currently one of the highest risk places in the country for poor public health. Childhood asthma and pulmonary dysfunction have very high prevalence due to diesel exhausts, allergens, and other pollutants , from concentrated truck and bus traffic. The Vertical Farm aims to effect this problem by greatly reducing the need to shuttle food products and garbage into and out of the city. Improved air quality from reduced truck traffic would help reduce the childhood asthma burden in Northern Manhattan, a health problem that has significant economic consequences to poor, uninsured families, single parents, and the healthcare system which supports them. In addition, the availability of fresh produce in city without the costs of transportation could ultimately make healthy fruits and vegetables less expensive and more accessible in poor neighborhoods where the public health burden for obesity- and nutritional-related diseases is highest , . It would also benefit students and employees of Columbia University and employees of the City of New York by providing them the same dietary and economic service. A reasonable financial assessment of the urban hydroponics in terms of both initial investment and operating economics shows that such a facility, when properly conceived, would certainly be profitable. Profitability is absolutely critical in the first permutation of the Vertical Farm, as the idea must prove its ability to sustain itself in all aspects, and to provide resources necessary for future development. The key to consistent profitability is cost saving. As the first Vertical Farm will undoubtedly be the most costly from a unit cost standpoint due to the lack of an appropriate model for integrating so many technologies, keeping costs down was a major concern within this analysis. Ultimately, the economic realization that renewable energy and sustainable resource technologies held the key to long-term cost reductions justified the high capital cost of incorporating these building elements. While companies, scientists and individuals from around the globe seek the next development in environmental harm reduction from human activities, the Vertical Farm concept is still seen as implausible outsider. Still, the impetus to place investment power in “green” initiatives is clearly growing, and money to bring the first Vertical Farm to fruition is more than available in the corporate sector. Highlighting the substantial economic benefits of vertical farming will be crucial in swaying the interest of corporate investment teams towards taking the risk. Direct investment groups like venture capital firms and philanthropic foundations have large financial resource pools from which risky but worthwhile ideas can be initiated. Getting the funds from these sources requires a selling of the concept; providing a vision for the future. Both of these groups are very interested making breakthroughs in social good, but they are constantly inundated with project proposals and getting to be among the chosen few is a time consuming task requiring great persistence. Finally, targeting the right stakeholder groups and tying the Vertical Farm into the community is absolutely necessary in order to win popular and political support. Whether in New York, San Francisco, Reykjavik, or Bamako, learning the needs and desires of major urban institutions like Columbia University and the government of the City of New York allows the Vertical Farm Entrepreneurship to become much more than just a green business venture, but a vision of successful of urban development. The vision of vertical farming is idyllic and powerful, and it must be these things in order to move the project in the right direction for many years to come. Today, while the vertical farm remains a hodge-podge concept of myriad technologies, the most important next step is to build the first permutation: the Vertical Farm Laboratory. The facility is unlikely to be elegant; certainly it will not be perfect. However, without breaching the page and screen to become a tangible, sensory reality, the future of the Vertical Farm remains perilous at best. For this reason, the Vertical Farm Entrepreneurship has laid the groundwork for an economic evaluation of such a project. The Entrepreneurship hopes that the information within this report will provide assistance to the team who takes the next step towards developing the Vertical Farm: securing the funding and building the partnerships that will comprise the world’s first Vertical Farm venture.